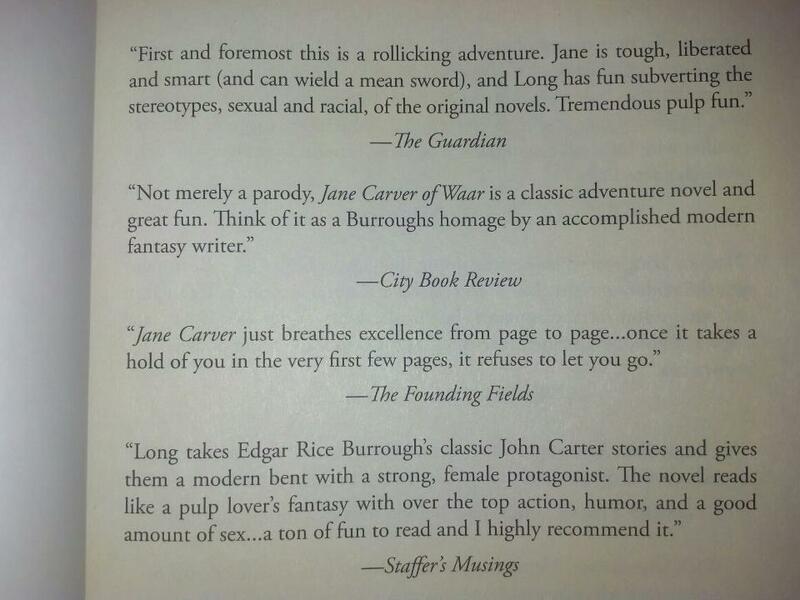 As you can see, The Founding Fields has a blurb in this book. Said book being Swords of Waar by Nathan Long and the blurb being from my review of Jane Carver of Waar, the first book in Nathan’s new series that is inspired in part from Edgar Rice Burroughs’ John Carter novels. You can find my review of the book here. This happens to be the second published blurb for The Founding Fields, the other being from blog owner Commissar Ploss, and this is a huge, huge thing for us. Particularly for me, since that’s MY FREAKIN FIRST EVER REVIEW BLURB. *AHEM* There was much oooh-ing and aaaah-ing when Larry (co-blog owner) informed me about this yesterday and when he sent me that pic above. I’m super, super excited for this. This is like a validation for everything I’ve done in the 13 months that I’ve been reviewing and its all thanks to Ploss since he is the one who set me on this path, to being a more professional reviewer than I’d envisioned myself being when I wrote my first one for this very blog. So yeah, thanks to Nathan Long for an excellent novel, thanks to Night Shade Books for publishing this piece of awesomeness, and thanks to everybody who’s supported me this far. Did I also mention that Nathan Long is one of my top favourite authors? Yeah, that too!! Now I can’t wait for my copy of Swords of Waar to arrive. Epic! I was so over-the-moon about this that I went ahead and bought Jane Carver of Waar then and there from the bookstore. It looks so epic and shiny and beautiful that words absolutely fail me. And also, shoutout to my friend Justin Landon from the Staffer’s Musings blog who is quoted below me. Cheers man!